When Iranian interrogators accuse fashion models of being part of a cabal led by Kim Kardashian, do they believe their own loony charge? 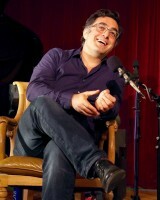 Journalist Maziar Bahari thinks they might. We talk about the effects of official propaganda, the plight of Iran’s Baha’i community, and his own imprisonment – all more amusing than you’d expect in the hands of this smart, brave and very funny man.